The headline for our October commentary was “Why am I down when the markets up?” As of September 30th, the iShares Core S&P 500 ETF (IVV) was up 10.53%. Growth was outperforming Value by 13.65%, and small caps were up a staggering 23.96% on the year. 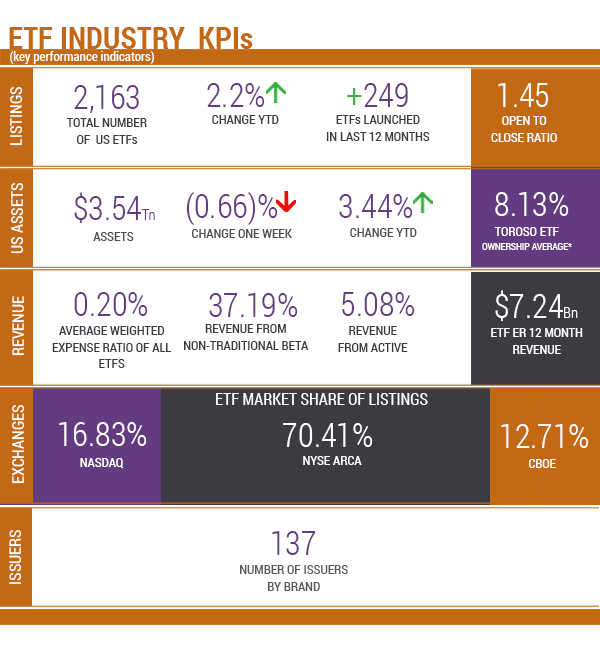 Fast forward 50 days, IVV is still holding onto positive returns (4.07%) held up by growth and small caps stock’s strong 9 month start to the year, while almost everything else is down. To put into perspective the pain a diversified client experienced, a balanced portfolio, 60% in global equities, 40% in bonds, is down -2.27% year to date as of the end of October, trailing the S&P 500 by over 6%. This balanced portfolio lost 4% since quarter end, as US equities, international developed equities, emerging market equities, and bonds were all down. It’s important to note, the pain versus US equities was not because of it’s relative 4th quarter performance thus far, rather the 9 months leading up to it. That same 60/40 portfolio was only up a staggering 1.8% as of September 30th, as all 3 of international developed equities, emerging market equities, and bonds were down for the year before October even began. All while a savings account will net you 2%. Fear not, diversification is not dead, just sometimes painful! We often speak about the reversal (contraction) of quantitative easing by global central banks. The time has now come, and liquidity is draining as debt rolls over without redeployment across the globe. It’s effects on the markets are unknown. We were told not to fight the Fed during QE, and similar warnings may be forming as it unwinds. In previous blasts, we’ve covered how much the market is paying for each dollar of revenue, near record highs, but unicorns can only fly so high. This most similarly resembled the Tech expansion of the late 90s, as the expansionary period at the turn of the century was not pushed by stretched fundamentals. We’ll instead point out the United States’ expansion in net profit margins. Most of the returns experienced in US markets this year prior to October were driven by earnings growth. 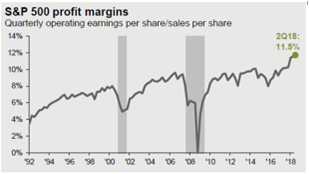 Since the bear market of ‘08, profit margins in the US have grown from average levels of around 6% to an all-time high of 11.5%. That means when FAANG stocks produced amazing quarterly results for the better part of half a decade, it was not just an increase in sales, but rather a significant increase in profit on each unit of sale. Margins can only be stretched so far, unicorns can only fly so high, and unreasonable expectations can only be met so many times before future expectations dwarf anything possible. From an economic perspective, an argument can be made that the US is still humming at full speed with low unemployment and wage growth. The market and the economy don’t always move in lockstep as you may know. In US equities, we have begun to shift away from traditional market-cap weighted index’s after a seemingly 9 year run in momentum stocks in favor of more unique structures to try and capture value in the large cap space such as Reverse Cap Weighted US Large Cap ETF (RVRS). 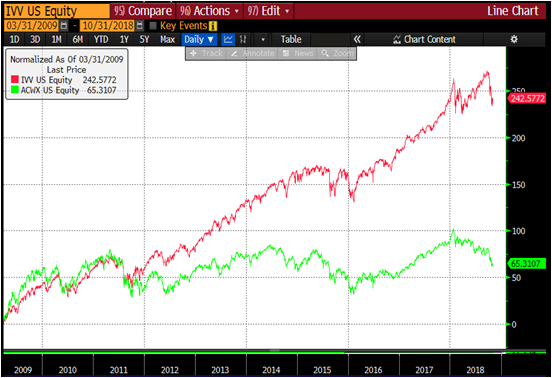 The economic benefits of the tax cuts and trade tariffs are what caused the continued divergence between US and International Equities this year, continuing the theme of the last 7 years. Many forget that emerging markets outperformed US equities substantially between 2016 and 2017, but the longer-term trend can be seen below. The dollar has increased in value by 7.23% measured by the Invesco DB US Dollar Bullish ETF (UUP) attributing to much of the recent divergence. China has been hit hard, down -15.6% on the year (iShares MSCI China ETF MCHI) at the center of trade tariff disputes. iShares MSCI Emerging Markets ETF (IEMG) was down -13.35% and lost -5.88% since the end of the third quarter. Trade tariffs with China have pushed Chinese markets down and have strengthened the dollar. China is also a source of global economic risk as debt levels in the region remain a concern. Despite this, we see much more upside in potential growth names in emerging markets when compared to the rest of the globe. If markets are to continue to fall, we don’t see downside in emerging markets being of much greater magnitude than domestic markets (from this point, as EM already has a head start down). Our focus in the emerging markets space has been what we call emerging market FAANG, allocated using the Emerging Markets Internet & Ecommerce ETF (EMQQ). The iShares Core US Aggregate bond ETF (AGG) is down -1.99% for the year and down -0.35% since the end of the 3rd quarter. Longer term treasuries performed even worse, as the iShares 20+ Treasury Bond ETF (TLT) is down -7.64% on the year and -1.77% since the end of the 3rd quarter. We are close to experiencing a negative yield curve, which historically has been a precursor to recessions. What exactly is a negative yield curve? 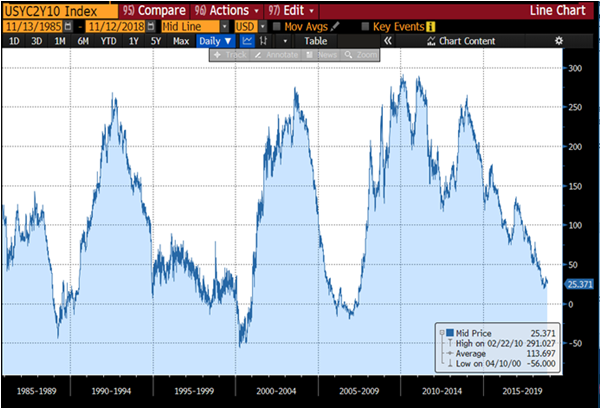 It’s when the difference in yield between a 10 year treasury bond and a 2 year treasury bond goes negative (shorter term debt yielding more than longer term debt). 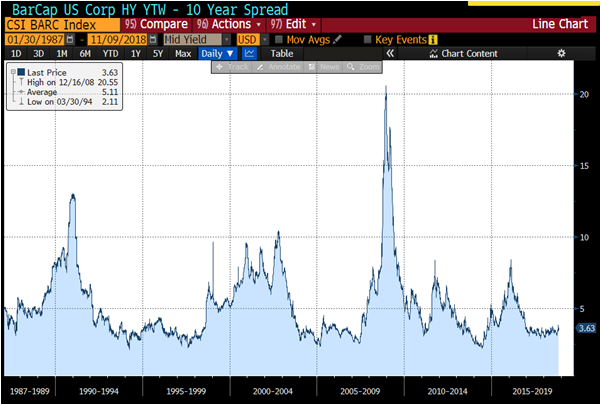 To see how close we are to this occurring a historical chart of the spread can be found below measured in basis points (100 is 1%). Another signal from bond markets that trouble is ahead is typically seen in credit spreads. A credit spread compares the yield between a US Treasury bond with bonds that have the same maturity but of lesser credit quality. 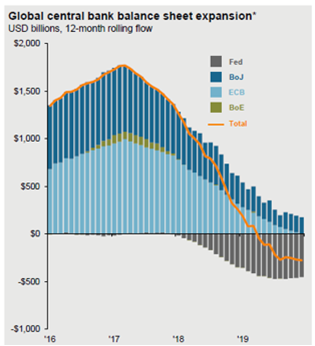 Spreads tend to widen preceding a recession by 3 to 12 months. Spreads have not begun to widen in any significant manor, but it is something we are monitoring. We continue to move further away from market cap weighted index’s in the fixed income space in favor of active approaches. The top ten largest high yield issuers are owned across the board by almost all broad high yield funds. Estimates for returns on a 60/40 portfolio over the next 5-10 years are mid to low single digits, almost no matter who you ask. Now more than ever, we find it important to think outside of traditional indexing and sector investing, and focus on alterative index construction and thematic investments. We believe this to be true because certain themes are irreversible. We also mention that market cap weighted ETFs overweight based upon size not successful trends. Think about what the failure of General Electric (GE) has done to the overall market. Worse than just that, is the fact that fixed income ETFS are weighted by availability of credit and issuance size contradicts the whole thesis around credit. Would you want to build a credit portfolio according to those who had the most debt with the lowest credit scores? Returns as of November 19, 2018. As of November 19, 2018. Source: Morningstar Direct.